Richmond Range was our final stop as we had been continuing our way north towards the QLD/NSW border. Showering along the trip was a luxury, as only one camp-site provided showers, which were cold water only. Therefore we relied on local towns and Google to tell us where public showers were. We were particularly keen for a hot shower as the day before we had taken turns using a single public cold shower. Thankfully the weather was warm and sunny, but that didn’t prevent the unstoppable gasp as cold water rained on our warm skin. So on this particular day, we stopped at a truck stop servo in Glen Innes where two public hot showers were provided, and we were even spared the $2 fee/shower! As we then travelled to Richmond Range, sections of road appeared wet, or rather as if the tar was melting on the surface. The RAV outdoor temperature revealed it was 40 degrees Celsius outside, which explained why the road appeared as it did. 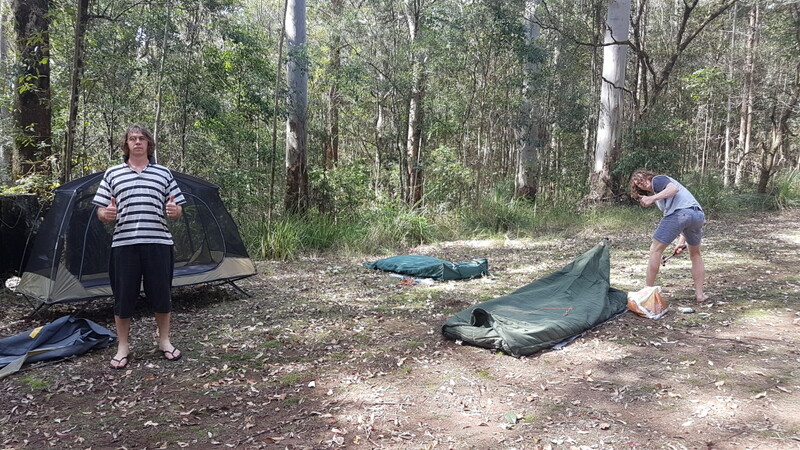 We arrived on-site, and by now had become very efficient at setting up camp. Even under the shade it was still 37 degrees with much insect activity. Most of us had opted for shorts to wear frogging, considering the weather. We headed down to the stream location we’d been entrusted with, stopping at several points along the stream, though the frogs were silent. We continued further downstream, then began flipping some stream-side rocks for the frogs, before placing them back. Still no calls. Peak calling activity for the Richmond Mountain Frog was October, if not earlier, so though calling has been confirmed in November, was it perhaps too late? All three of us were chewing over the fact in our heads that thus far we had 100% success in finding all our target frog species, seven to be exact. This would be our final night of the trip. We could try again early the next morning as this species also calls then, but we did have a long drive back home ahead of us and so an early start was required. I continued upstream as Ollie and Ben got distracted took the opportunity to photograph an endemic spiny-crayfish they had flipped. We were well acquainted with Philoria calls, however the trickling of the stream below meant you had to listen more closely for their distinctive call. 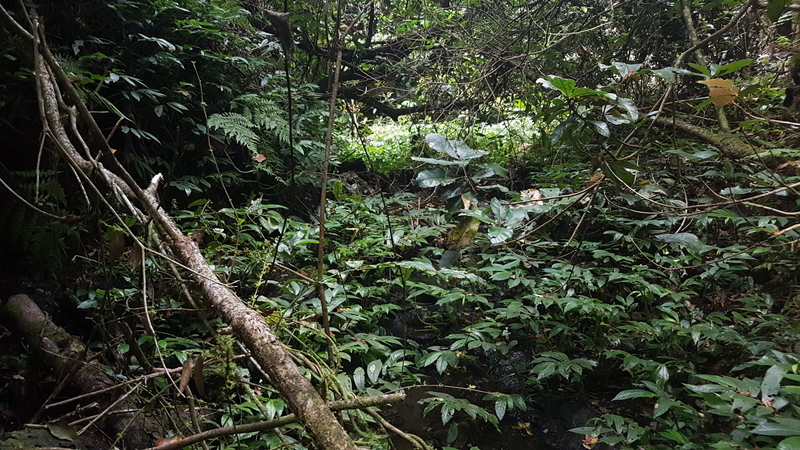 I continued further up the stream as the vegetation became thicker, then paused as I tuned in to what sounded like one, maybe two Richmond Mountain Frogs calling! Indeed they were calling, and I attempted to mask my excitement and relief when calling back to the others that I had got one. Ben and Ollie quickly joined me, and the three of us meant we could actually trianglulate the call of the closest frog. Earlier in the trip, this well known and used method of locating a calling frog wasn’t working for us, as we generally each manage alone to locate calling frogs amongst tricky vegetation. This male was calling from the side of an embankment, higher above the water than either of the three species we’d found before. We found him, got what photos we could of this particularly uncooperative frog and returned him to his calling perch. 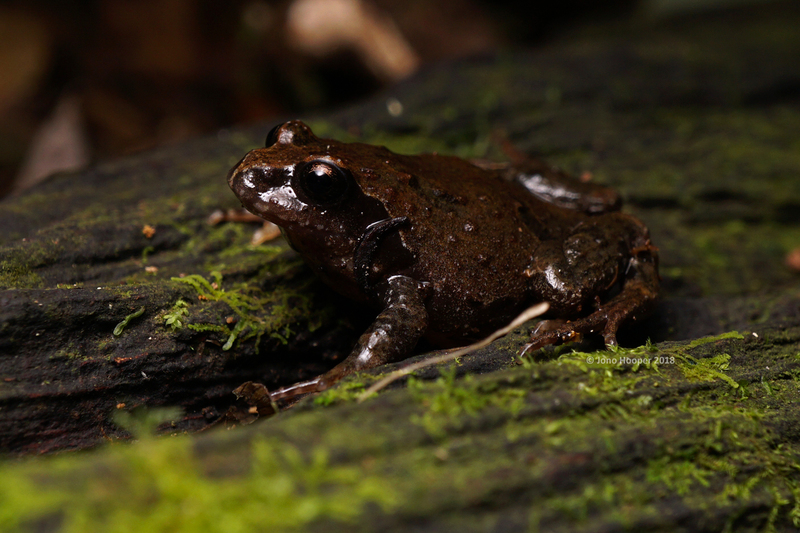 Richmond Range Mountain Frog (Philoria richmondensis), sporting a piece of bark above his arm. What a huge relief it had been to find our last Philoria of the trip, and we’d achieved a rare 100% success rate for the list of target frog species we had prepared. High-fives were had and exclamations of our achievement all round! On return to camp, it was still 31 degrees Celsius at 6:30pm NSW time. The shirts were ditched again in an attempt to cool oursleves, and the food and drinks came out. Later that night whilst road cruising we found several large Robust blind snakes (previously not recorded here), large and small carpet pythons, leaf-tail geckos, frog choruses, foraging Green-thighed frogs (Litoria brevipalmata) and several Stony-creek frogs (Litoria wilcoxii). Yellow-bellied gliders could be heard in the canopy, and a Mountain brushtail possum made an appearance. The heat did not relent; 28 degrees at midnight made for an uncomfortable sleep, as did the mosquitoes and accompanying flying insects. But it was all worth it. Good company, a bunch of good times and laughter had been shared…AND we got all the Philoria! This entry was tagged Green thighed frog, Litoria brevipalmata, Philoria richmondensis, Richmond Mountain Frog, Richmond Range National Park. Bookmark the permalink. By subscribing, you'll receive automatic email notifications each time a new post is published. Have a frog you want to identify? 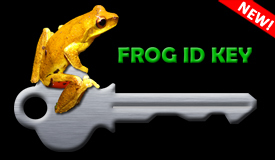 Use the simple but effective ID key, plus view species profiles, images and play calls at Frog ID Key.